Volume 1, issue 1. History to follow. It isn’t every day that the anniversary of an outdoor magazine offers testament to anything more than the passing of time, and, increasingly in the case of magazines, mere survival. But with the 20-year milestone of BIKE magazine comes a crap-ton more to celebrate: the entire modern ethos and evolution of mountain biking, and, just as importantly, the way it is documented. Before BIKE, you see, there was no such thing as a “mountain bike photographer,” and magazines dedicated to the sport were by and large race-oriented, covers universally cluttered with what, at the time, was considered the acme of “MB” photojournalism: fill-flash shots of sweaty, wild-eyed, lycra-and-logo-clad racers. Variations on the theme included the rider being splattered with water or mud, wearing warm- or cool-weather clothing, sometimes a headlamp. The sport’s Marin Country grassroots heroes had been left in the California dust in a rush for sport credibility and the mags were filled with downhill and cross-country race results, racer profiles, bike tests and gear, gear, gear. Advertised movies plumbed competition not culture, tenacity not travel. Adventure was nowhere to be found. The idea of freeriding had yet to coalesce. Bike parks were years away. And everyone was still wearing lycra. But that all changed when BIKE hit the newsstands with its first issue in March 1994. Conceived and launched under the Surfer Publications banner by the good folks at POWDER magazine—editors Steve Casimiro and Rob Story, along with publisher Brent Diamond—BIKE hit the dirt spinning. While mountain biking isn’t skiing and never will be, they were smart enough to see the crossovers between two deeply experiential pastimes that could take you places—both literally and figuratively—that you’d never been and perhaps wouldn’t otherwise go. In mountain biking, this applied equally to the idea of a trail deep into the wilderness or the heart of an urban greenspace, whether riding near home or in a far-off exotic landscape. To fulfill the mission, and because it was part of the photo-driven SURFER stable, the most immediate need was innovative photography that transmitted the feelings and experiences evoked by mountain biking. There wasn’t much out there, so recently minted POWDER Photo Editor David Reddick set about finding it, encouraging its creation, and curating the results—a task he iconically continues to this day. The photo vacuum was one into which many an outdoor photographer looking for a new challenge happily leaped (many directly off the POWDER masthead), and the evolution of mountain bike photography was fast and furious. 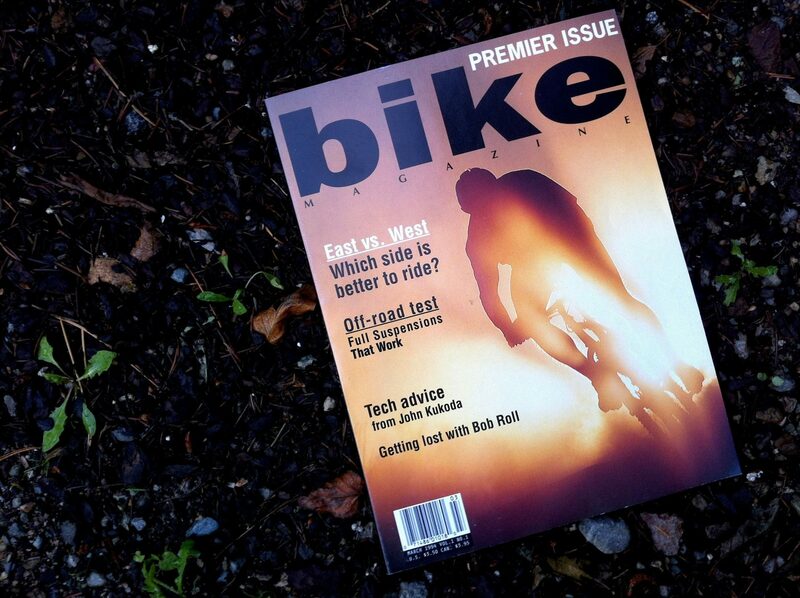 By 1996, BIKE’s third year of publication, the mag had grown from five to ten issues a year, people were travelling the globe to put knobby tires to dirt, and mountain bike photography had become a genuine genre. In addition to the travel revolution, much else was going on. Mountain bike festivals were booming, personalities and attitudes and looks were emerging, and bikes, components, materials, and clothing were all evolving to meet the new demands of what would soon—birthed on the pages of BIKE—become freeriding. Downhilling and cross-country and trials and even off-trail riding were coming together. Vancouver’s wild and globally influential North Shore trail-building scene was taking root; in the Kamloops hinterlands a group of hard-charging lads were seeing what their bikes could do off of trails on real mountain terrain. A genuine global non-racing mountain bike culture was finding an identity, and BIKE, which at first had merely held up a mirror, was now driving the bus. Many factors were involved in the establishment and evolution of today’s unbelievably vibrant mountain bike scene, ranging from technical to economic, from the athletes to the companies involved, from the photographers and movie-makers who jumped on board to expand that universe. So although there may have been a whiff of the same air of inevitability one could sense in the early snowboard milieu, it’s fair to say that without BIKE’s pioneering exposure (pun intended) of the greater mountain biking world and crucible of photo creativity, we may or may not have ever seen the likes of bike parks, Crankworx, and Deep Summer, or the wicked interpretive talents that photographers like John Gibson, Sterling Lorence and a host of others too numerous to name brought to bear on the sport. So cheers to 20 years, BIKE, we’re more grateful than you’ll ever know—if only for not having to still wear lycra.